The vibrant metallic sheets with a smooth and bright finish to enhance your content and make your presentation more attractive effortlessly. 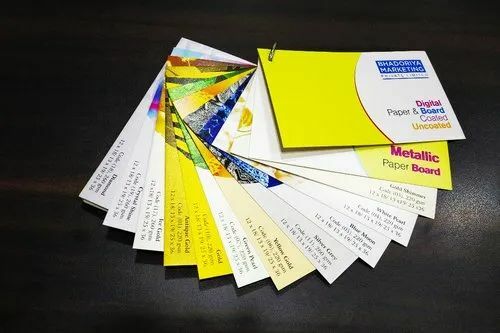 Ice Gold, Pearl mettalic, Real gold and many more mettalic sheets readly available for multiple uses such as Invitation cards, Visiting cards, Brochure, Album, Wedding Card. We, Bhadoriya Marketing Private Limited from 2016 are famous amongst the esteemed wholesaler and trader of an exceptional quality assortment of Coated and Metallic Paper. Offered products range consists of Coated Paper, Textured Paper, and Metallic Paper. The range manufactured by our vendors is designed under the supervision of quality controllers. In adding to this, these products are known for their easy usability, long service life, and lightweight.